I made this thread for some epic/good cades. here is one that is okay in my books. mine was so good it lasted the whole round. i only lost a couch. i also turned it into a motivator. 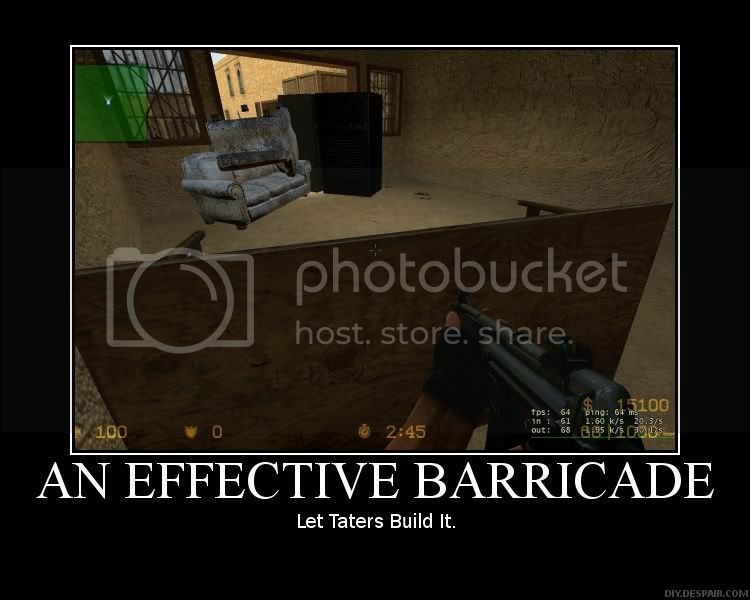 Wow taters your lucky you didn't lose more than that from the way it is put together. Guess i will have to build one that can't be torn down to show you a real one. So much work that i think i will pass on it actually. I use to have screenshots posted on here of my weapon skins that I used. A few of them included shots of some of my more elaborate barricades that I have constructed. I remember one of them actually used about 10-12 objects tightly stacked in a way that pulling/pushing on any of them would result in them locking tighter together.